President Trump toured a US-Mexico border area in California on Friday. WASHINGTON — President Trump claimed Friday that ‘‘our country is full’’ as he tried to warn off migrants arriving at the southern border in increasing numbers, and threatened Mexico with automobile tariffs if the country doesn’t step up its efforts to curb migration from Central America. Trump’s claim that the United States is ‘‘full’’ prompted immediate pushback from his critics. Trump mixed fact with fiction when warning of the threat at the border. When complaining about the Flores legal settlement that governs treatment of migrant children and families, he blamed ‘‘Judge Flores, whoever you may be.’’ But Flores was an unaccompanied 15-year-old girl from El Salvador. Trump has been increasingly exasperated at his inability to halt the swelling number of migrants entering the United States, including thousands who have been released after arriving because border officials have no space for them. Arrests along the southern border have skyrocketed in recent months, and border agents were on track to make 100,000 arrests or denials of entry in March, a 12-year high. More than half of those are families with children, who require extra care. 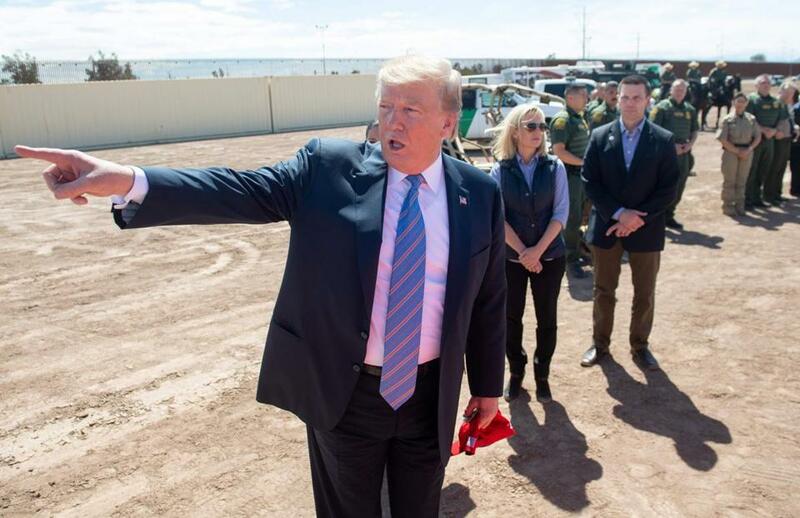 The rhetoric during Trump’s border tour Friday continued days of escalating threats to shut down the US-Mexico border, although he gradually backed off the pledge in recent days. His two-day trip to the West also included fund-raisers and a speech to the Republican Jewish Coalition this weekend. Before leaving for California on Friday, Trump said he still ‘‘may shut it down at some point,’’ but that he was focused instead on issuing tariffs against automobiles from Mexico as a potential punitive measure. Since the threat, Mexico has been ‘‘absolutely terrific,’’ Trump said. ‘‘Mexico, I have to say, has been very, very good — you know that — over the last four days, since I talked about shutting down the border,’’ Trump said on the South Lawn of the White House. Speakers at the protest emphasized that people on both sides of the border were one community and that the agriculture sector couldn’t flourish without Mexican farmworkers. A small number of the president’s defenders — including about a half-dozen women wearing ‘‘Make America Great Again’’ hats — were also there, but dozens of police officers kept the crowd away from the border site Trump would visit. Although about 650 miles of the US-Mexico is fenced off, no new border barriers have been erected during Trump’s presidency. Barriers in Calexico, which amount to a 30-foot-tall, 2.25-mile length of steel slats, replaced an existing fence and had been in the works since at least 2009. ‘‘I think the president is always going to be quick to declare a victory even when he didn’t have a hand in the fight,’’ Representative Pete Aguilar, a California Democrat, said Friday before the border visit.